Nokia's rugged engineering and Android operating system make a sweet combination. This combination will be arriving in the form of Nokia X to Indian markets on 15th March, 2014 for Rs.8500.00. The Nokia X is already listed on the Mobile Store website but without a price and with 'coming soon' label. But sources have confirmed that Nokia X will be officially launched in India on 10th March and will be available all around the country on 15th March. Nokia is hosting a media event to launch the device on 10 March where it will officially announce all the prices. The Nokia X is one of the three Android smartphones announced by Nokia at the MWC last month. Other than Nokia X, the other devices are called Nokia X+ and XL. Nokia had that at that time announced that Nokia X would be retailed for 89 euros (approx Rs 7,600.00), the X+ for 99 euros (approx Rs 8,400.00). Nokia X and X+ will have 4 inch display while the Nokia XL will be a 5-incher phone. The display resolution in both Nokia X and X+ will be 800×480 pixel resolution (~233 ppi pixel density). Both Nokia X and X+ will run on Qualcomm MSM8225 Snapdragon S4 Play with a dual-core Cortex A5 processor clocked at 1GHz and Adreno 203 GPU. There’s 512MB of RAM on the Nokia X, while the X+ gets 768MB of RAM. Both have 4GB internal storage with MicroSD card slot for expansion upto 32GB. Both the smart phones will have a 3MP rear camera and none on the front. Both phones will run on a 1500 mAh battery which is fair enough. For connectivity, the X and X+ have dual SIM slots (micro-SIM), 3G, Wi-Fi b/g/n and Bluetooth 3.0. The Nokia X is available in its Black, Green, Cyan, Yellow, Red, and White colour variants. 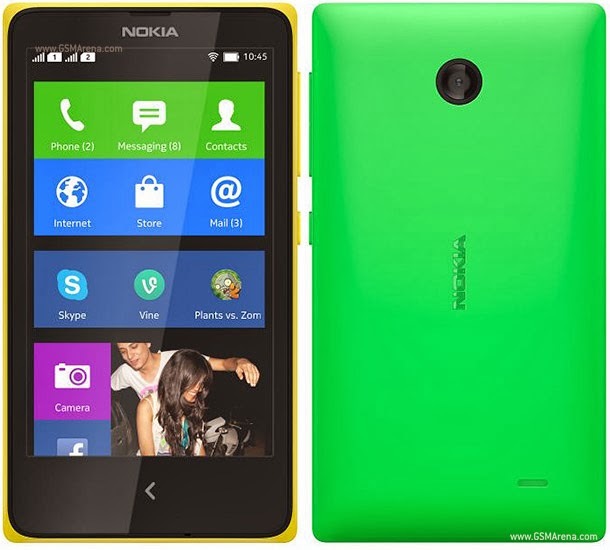 Nokia XL has 768MB RAM, 5MP auto-focus camera with LED flash on the back and 2MP front camera. It will also have the same processing power as X and X+. The most important thing is that you cant access Google Play and Google Services without rooting all the three smart phones. You can however sideload the APK files, third party Apps and download Apps from Nokia's own store. You will get Skype, Outlook and OneDrive on these phones and Bing will be the default search Engine. As a promotional freebie, Nokia and Microsoft will be giving the buyers one month of free Skype calls to mobiles and landlines when they purchase the Nokia X. Which means that you can call any landline or mobile number through Skype for a period of one month. Not a bad bargain for Rs.8500.00 given that Nokia smart phones are durable and rugged. The only problem is that you will need Google Play and other Google Services and for that you will have to root your Nokia X, if you buy it. Sounds reasonable but will have to try it and see. Thank you for the info.